In addition to Crécy, I also bought Frankenstein’s Womb as part of the Avatar Press sale on Comixology. I was going to use it as an additional example of Warren Ellis writing a history lesson — but as I reread the story, I realized that it was actually much deeper than that. It appeared to deliberately contrast against Alan Moore’s From Hell — not just superficially, but thematically as well. 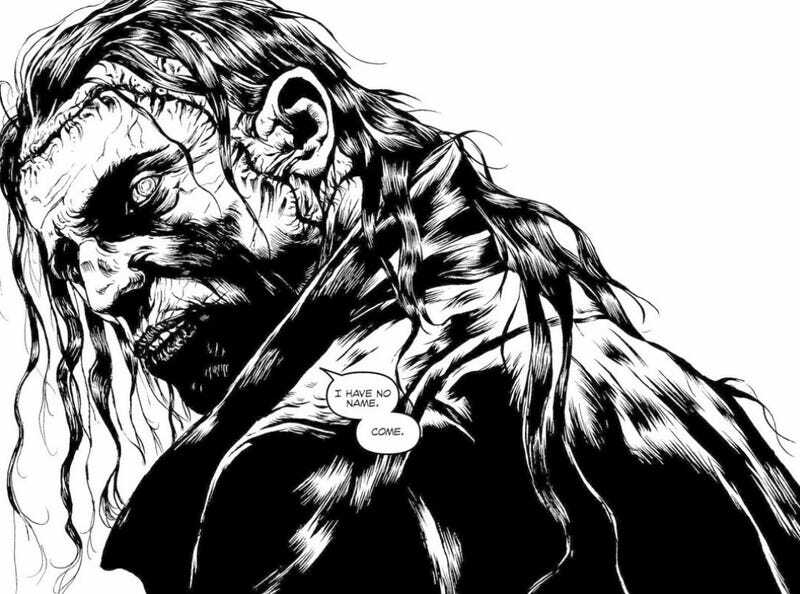 Frankenstein’s Womb, a graphic novel by Warren Ellis and Marek Oleksicki, is a story about Mary Shelly and Frankenstein. Or, rather, a story about the history of Mary Shelly, as told by Frankenstein’s monster to her. During a stop on their trip to Darmstadt, Mary Godwin (soon to be Shelley) decides to visit Frankenstein Castle. There, she runs across a man. As the monster guides Mary through the castle, he shows her the past of Johann Conrad Dippel, often thought to be the inspiration behind Victor Frankenstein. The monster tells Mary that Dippel is an alchemist that sought the elixir of immortality. As the monster shows Mary his birth, he contrasts it with Mary’s own birth, which caused her mother to die. Finally, Mary gets fed up with being led around and confronts the monster about his ramblings. And so he shows her the future. This scene, in fact, this entire sequence is deliberately evoking and contrasting From Hell by Alan Moore and Eddie Campbell. In From Hell, Sir William Withey Gull, the Queen’s physician, becomes Jack the Ripper when he kills a number of prostitutes that threatened to blackmail the royal family. Gull, however, firmly believes that the murders will also serve as a ritual in order to preserve male power over female power. When Gull has finally killed his last victim and is mutilating her body (as part of his ritual), he has a vision of the future. Gull reacts to the present day office building in shock and horror. He considers this place — where technology has eased everyone’s burdens, where women wear tight clothing and nobody seems to care — to be Hell. He despises the future, unlike Mary who seems in awe of it, the fact that life can be brought from electricity. There’s also the fact that Gull is a complete misogynist. He considers killing Mary Kelly to be his gift — otherwise, she would have lived a dull and uninteresting life, dying from “liver failure, men or childbirth,” while now, she will live forever as one of the victims of Jack the Ripper. Mary achieves immortality through her works, through her books, her fiction. It is through herself she achieves it, while Gull believes himself to have made Mary Kelly immortal simply by killing her. Notice the line “You die, Mary, giving birth to the future”? Now where have we heard that before? Gull believes that he is delivered the future, given birth to it, but in Frankenstein’s Womb, it’s Mary Shelley who gives birth to the future. It’s her future, not Jack the Ripper’s. I could go on about the contrasts between the two books — how Gull’s misogyny and opposition to women’s suffrage in From Hell in contrasted with Mary Shelley and her mother’s belief in making a “new genus” of women or that Gull seeks to “purify” the women he is killing, transmuting them from the “base matter” they are, while the monster explains that Mary Shelly is already “gold wrought from base matter,” as she was born from the dead. And then there is Gull’s declaration of his love for Mary Kelly. “Do you understand how I have loved you?” Gull is, quite obviously, going insane, but this line perfectly shows his thinking in all this — that he is doing these killings because he believes it is for the best. That by killing Mary Kelley, he is sparing her a dull future. He believes this is love. Unlike the monster, who showed Mary Shelley the future in order to prepare her. Gull believes he is working alchemy, changing the world. But it is Mary Shelley who is the alchemist, who achieves immortality and changes the world not through death, but through life. I’m not sure of Warren Ellis did all this deliberately, but the two books almost work in conjunction — From Hell, however, is the bleaker view, while Frankenstein’s Womb is the brighter one, the one lit by electricity.